In honor of Veterans Day, Good Chemistry will be providing a 20% off discount on all products to those who have served in America’s armed forces on Sunday, November 11 and Monday, November 12. Originally established in 1938, Veterans Day honors those who have served the country during times of war or peace. Good Chemistry is a proud employer of veterans, and we support those who have served through veterans support projects, and by providing regular discounts for veterans on Good Chemistry products. If you are Veteran please bring your Military ID or documentation of service to our 9 Harrison St. location in Worcester’s Canal District on Sunday and Monday so we can thank you in person. 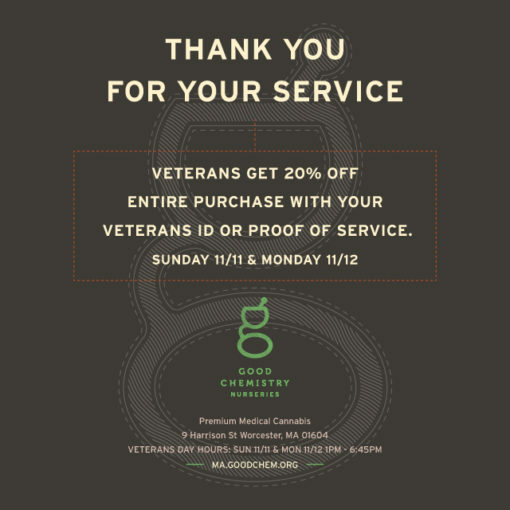 In honor of Veterans Day, Good Chemistry will be opening at 1 p.m. on Sunday, November 11 and Monday, November 12.